Glam Style Nails by Carolina: WELCOME TO MY FIRST GUEST "GIOVANNA FROM GIO_NAILS!" WELCOME TO MY FIRST GUEST "GIOVANNA FROM GIO_NAILS!" Hello girls!. Today I decide not to post any of my designs, because today is my first guest post of the month!!!.. And I'm so exited to give a warm welcome to a very amazing an talented girl I found end of last year where I saw her designs in a Nail Art Group and since then I became a fan and that happily accepted to do a guest post for all of us!. To see all the guest post she share with us please go to my Blog or do click in the link below!. I hope you like this design as much as I did when I see it for the first time!. 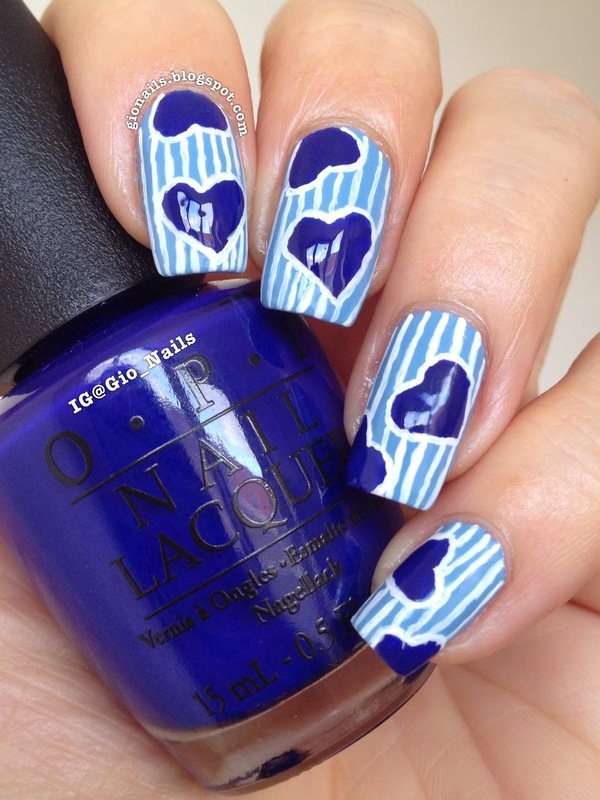 I'm Giovanna from the blog GioNails and it's a great pleasure to be here with you today. I met Carolina through the #sharethelove movement a few weeks ago and she was the first one to share my page on Facebook. Carolina, you are such a sweet person! I was very surprised and extremely happy when she asked me to do a guest post for her blog. So here I am with you today. I wanted something very special, something to show how grateful I am for this invitation; and since it's Valentine's Month, nothing better than love right?! 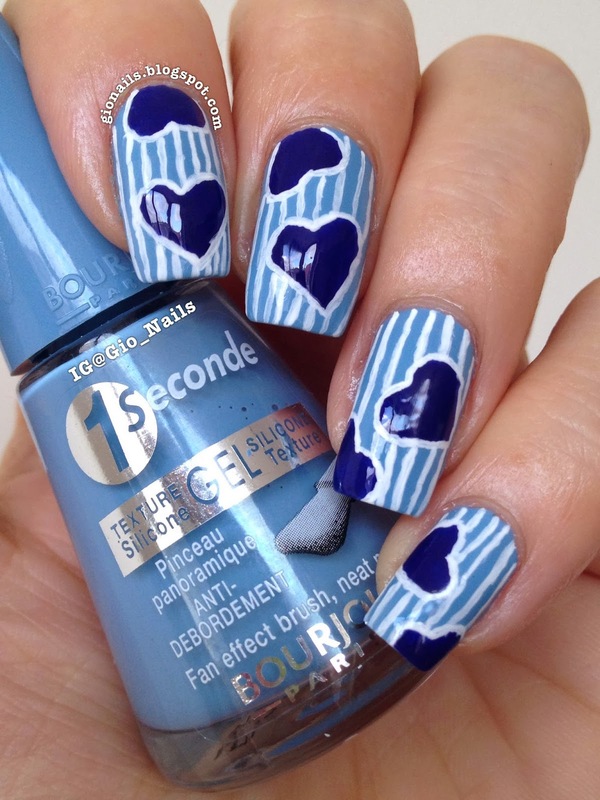 I started off with two coats of this wonderful Bleu Water by Bourjois (I love blue!). It's a cream polish, very easy to pose and it dries quickly as well so when I was done with the second coat I could already start with the art. 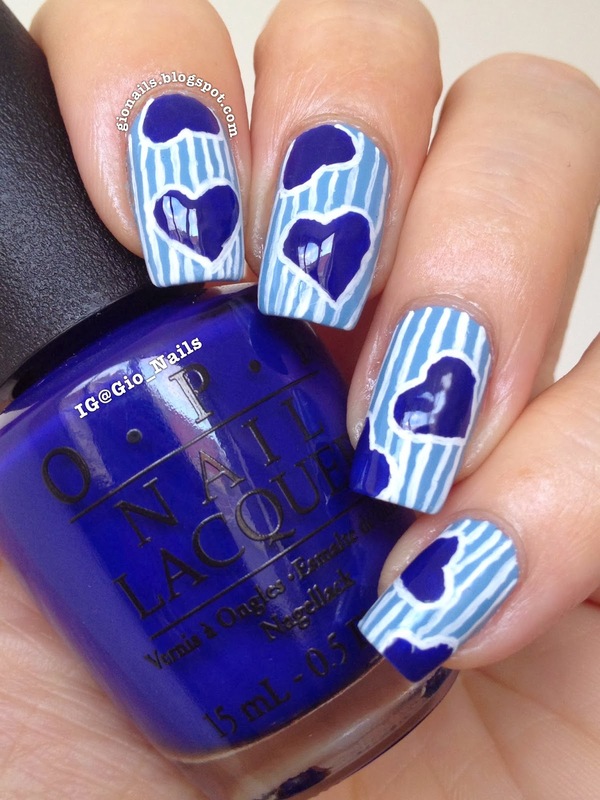 I freehanded the hearts using OPI…Eurso Euro and a medium nail art brush. Then, with a detail brush and white acrylic paint I outlined them. The last step was to patiently do the straight thin lines, also with acrylic paint. I love how this manicure turned out and I hope you enjoyed seeing it as much as I did doing it. I'd love to know what you think of it. Yeeeeeeeeey! I really enjoyed preparing this post to your blog Carolina! I'm really glad you like it as well! Have just shared on my facebook page and saw you tagged me on your IG account. Thank you so much for inviting me to be your first guest post. Have a great weekend dear!